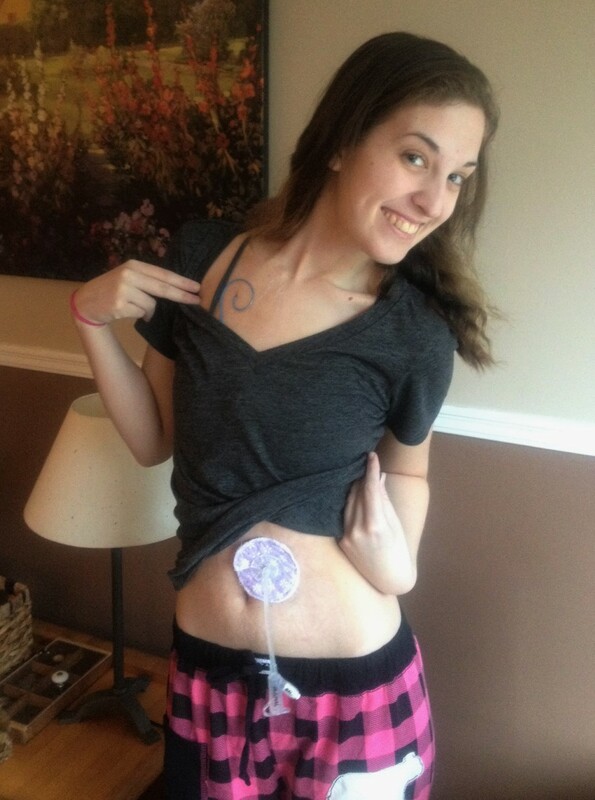 Happy Feeding Tube Awareness Week! The Feeding Tube Awareness Foundation started this awareness week in an effort to eliminate the stigma around feeding tubes and celebrate the lives they make possible. 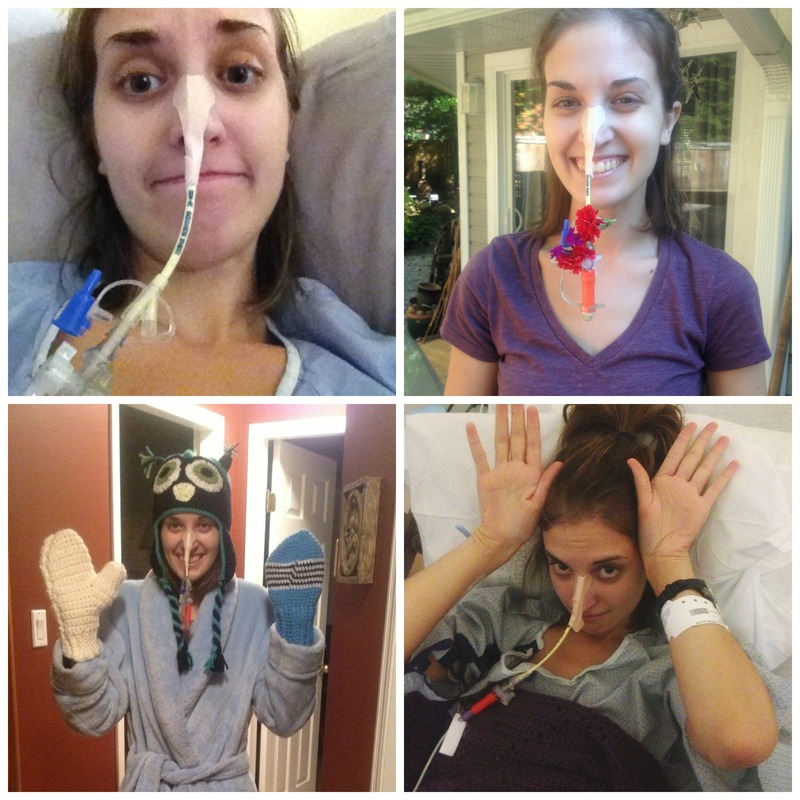 The theme of Feeding Tube Awareness Week this year is “the truth about tube feeding” and the focus for today is education, so in the spirit of it all I’m sharing a little bit more about the medical-y day to day of my life. 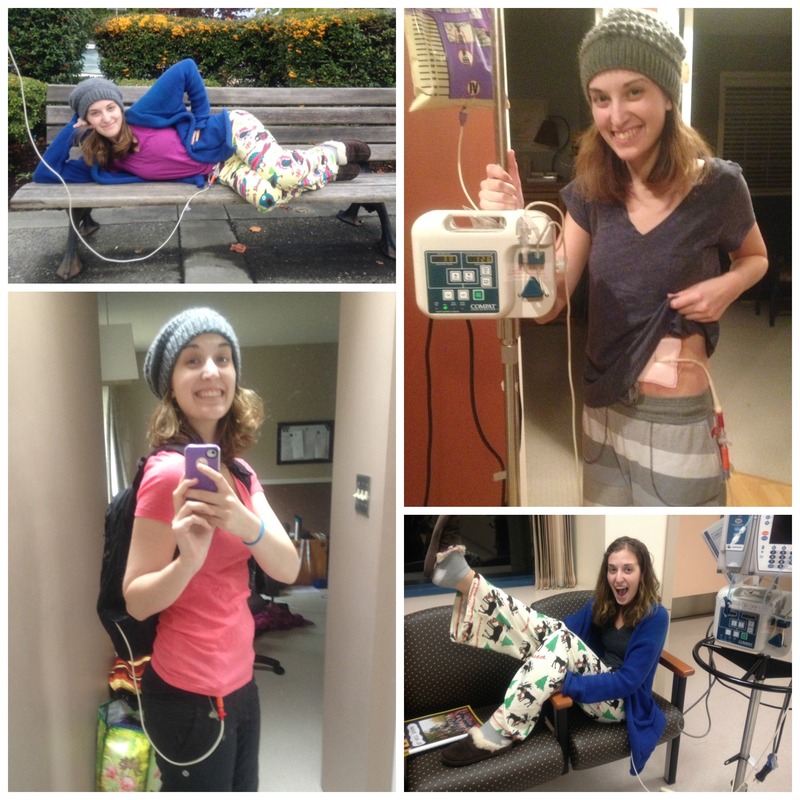 Today is Feeding Tube 101, and since my life got slightly more complicated when I started TPN in the fall, tomorrow I’ll talk about the rest of it. Disclaimer, my day to day life is not going to be the same as someone else with a feeding tube. There are hundreds of different reasons why people need tubes, and as such everyone’s day to day will be a little (or a lot) different. Some tubes are short. Some tubes are long. But all tubes just want to feel like they belong! But really, there are so many different kinds! Let me decode them for you: G=gastric, or into the stomach; J=jejunal, or into the jejunum which is the second part of the small intestine; N=nasal, through the nose; Fr=French, which is the unit of measurement used to describe feeding tube diameters. G tubes are used when the stomach still functions properly. Depending on why someone has a G tube, they may do bolus feeds, which means a large volume over a short period (much like a regular meal) or continuous feeds, which involves a set rate of formula per hour over many hours. J tubes are used when the stomach function is impaired and the formula needs to be delivered directly into the intestine. J tube feeds must be delivered continuously at a lower rate because while the stomach has a ton of reservoir volume, the small intestine has a much smaller capacity. And to make things even more confusing there are also the hybrid GJ tubes, which have access to both the stomach (G) and the intestine (J) all through the same stoma, or opening, in the stomach. Those are the basics, but tubes can also be differentiated by make, placement and style. Fun (irrelevant for most people reading this) fact: I have a 16Fr Mic J tube. I (un)affectionately referred to this tube as Babar. You can see the resemblance, right? Despite my smile, I really wasn’t lying when I said those were 26 terrible days. I’ll spare you the traumatic details but I ended up having it pulled six days early in the ER because I could not tolerate it any longer. But regardless of how awful that time in my life was, I mostly just shake my head and laugh about it now. I started with an NJ tube because the hope was that it would just be temporary. I gave it my best effort but my need for nutritional support persisted, which is why I had my J tube surgically placed in January of 2014. 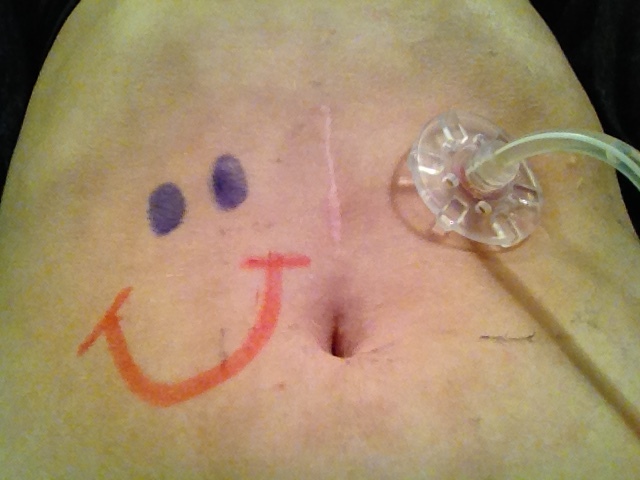 My feeding tube (the one in my belly…duh) was surgically placed right into my small intestine. It hurt, a lot. The surgeons all said it shouldn’t cause any post-operative pain, but I would like them to plant foreign objects in their abdomens, leave them there, and then get back to me on that. It was a good eight to ten weeks before I was completely pain free, but by that point in time I was well underway in my never-ending battle with granulation tissue, a battle that continues to this day. If you haven’t read my posts from last spring where I’m pretty sure I talk about granulation tissue a lot, it’s basically tissue the body produces to try and heal wounds. In most cases this is a good thing but in the case of having a feeding tube where you need that stoma to stay open, granulation tissue is bad. I have tons of pictures (seriously, I have so many) of my poor stoma overrun with granulation tissue and covered in ugly stains from trying to burn it off with silver nitrate, but don’t worry I won’t share those with you! You can look at these pictures instead! Other than feeling some pressure from the balloon if the tube gets snagged, I don’t feel it inside me. I do, however, experience discomfort when I flush larger volumes of water. And if the water is really cold I can feel that, too! There are days when it is very painful and days when I forget it’s even there, and so far I can’t figure out a rhyme or reason for that. Here’s a random tidbit for you…oftentimes stomachs or intestines will try to digest feeding tubes. By this I mean that normal peristalsis is taking place inside the digestive tract and the internal parts of the tubes get pulled along, sucking the tube in tight against the skin. I like to think of it as a game of tug-of-war between my intestines and the outside world. Basically it’s just annoying and vaguely uncomfortable, though sometimes it’s quite painful. Before I had gastroparesis and before I knew much of anything about feeding tubes, the truth is that I thought they were pretty icky. In my earlier days of gastroparesis when feeding tubes were something only the really severe cases required, I still thought that. And honestly? They’re not exactly glamorous, but having a tube? And using that tube in public? There’s nothing gross or icky about that! Someone tube feeding in public should be seen no differently than someone eating ‘normally’ in public. Flushing water through a tube should be seen no differently than someone taking a drink from a water bottle. Feeding tubes are not something to be feared. Some people can’t walk and they need a wheelchair. Some people can’t see and they need glasses. Some people can’t eat and they need feeding tubes. It’s as simple as that. Feeding tubes aren’t the magic solution for everyone, as mine certainly wasn’t for me, but they do keep people alive and they help people thrive. They allow babies to grow into children, they allow children to grow into adults, and they allow adults to keep living. They aren’t contagious or scary. They’re real. They’re just part of real life. And there shouldn’t be shame or embarrassment associated with anything that gives you have a chance at a life. I was diagnosed with GP 6 months ago but it was long over due. I am now at zero tolerance for food/water. I’m awaiting a call from my GI on possible IV supplementation or NJ but today is day 3 and no answer. I have a hydration appointment tmw or I’d go to the glorious ER 🙄. Any suggestions? Hi Angela – sorry to hear you are struggling so much. Not knowing your whole situation I can’t give you any medical advice or suggestions, but I do hope that you’re able to work something out with your GI. Good luck! Hi Melissa – so sorry to hear you’re in so much pain! My surgeon really downplayed how much pain it would cause beforehand, and continued to after my surgery as well. But it hurt! It was about 8 weeks before I was able to say, “hey, I wasn’t in pain today,” but it does get better! And it doesn’t take 8 weeks before it becomes manageable. This is tough, but you are tougher, and you’re going to be okay. Thank you for sharing your experience! I had an NJ tube due to an extremely severe case of Hyperemesis Gravidarum. 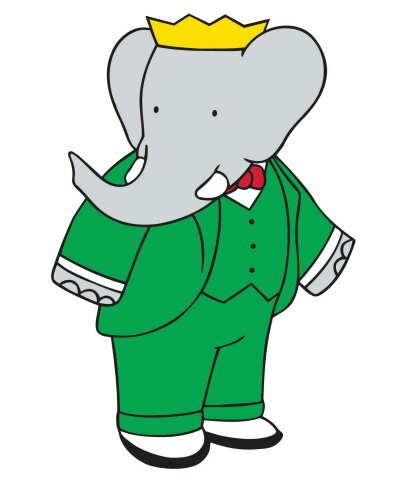 I can totally relate to your unaffectionately naming it Babar. I’ve created a blog about my experience as well, well more like “our” because it’s a compilation of all things HG. Good luck on your journey, and thanks for sharing! My mom gets a tummy feeding tube soon but now she has an NG. I was informed today that I will be helping with feedings when I go home for Christmas and I wanted to say thank you for your frank discussion which makes me more comfortable. You are very welcome, Rita, I’m glad I can help in any small way 🙂 Good luck helping out with your mom’s feeding tube. I know it’s overwhelming at first but I promise it all becomes routine very quickly! Thank you so much for your posts! I just got a J-tube of my own, and it’s been helpful to read about your experiences. I posted a link to this on my own blog, and I wanted to share the link with you. Keep up the great posts! “There shouldn’t be shame or embarrassment associated with anything that gives you have a chance at a life.” Well said!